More than 7 tonnes of ivory were seized in a single raid by customs officials in the eastern province of Anhui in March, state broadcaster CCTV reported on Monday. The record haul, totalling 2,748 elephant tusks, was the biggest ivory seizure handled by customs officials in recent years, the General Administration of Customs told a news conference on Monday. Twenty-six suspected members of an international trafficking ring were arrested by the authorities on March 30 as part of a coordinated operation between customs officials and police across six provinces. The ivory was seized from a disused factory in the remote town of Gaogou on the same day. 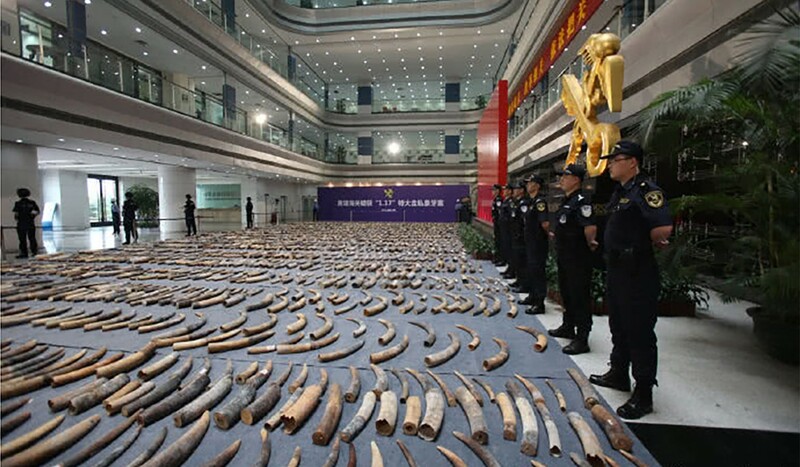 The authorities discovered 62 wooden boxes filled to the brim with ivory tusks of various lengths, Huangpu Customs Agency official Qiu Wei was quoted as saying. Many of the crates were hidden inside two larger crates. “There were also plastic bags for storing ivory, which means that they smuggled very large quantities of ivory multiple times, not just once,” Qiu said. last year, in a move praised as a major sign of progress for the world’s biggest ivory markets. in prison by Tanzanian authorities in February. Under mainland law, offenders can be jailed for terms of under five years to life, depending on the value of the ivory trafficked. Around 300,000 elephants are killed worldwide every year [sic – about 20,00 or less every year] by poachers for their ivory, according to animal welfare campaigners. Customs officials discovered a lead from another ivory smuggling case in 2013, in which 4.46 tonnes were seized by Huangpu customs officials. The suspects – a father and two sons surnamed Chen from Fujian province – fled to Southeast Asia and continued to smuggle ivory from Africa into China. The Chens were eventually arrested, but the authorities found that the false identities they used registered a lot of time spent in Gaogou. Customs officials then visited the town in March and found a group of Chinese migrants with Fujian accents discussing the sensitivity of “rice wine”, a code word for ivory. They arrested the group of six Fujianese smugglers and raided the factory in the early hours of March 30. On the same day, police in Hefei, Anhui’s provincial capital, Beijing, Fuzhou, the capital of Fujian province, and Qingdao, in Shandong, arrested 20 other suspects linked to the trafficking ring. “This is the biggest amount of ivory seized in a single case independently investigated by the anti-smuggling bureau of the General Administration of Customs,” bureau director Sun Zhijie said on Monday.